A week after we thought it was finally over, El Nino came back to make his own rules for both Vallejo Races. Saturday the Triton fleet got the gun as the wind was fading on a cold, grey, drizzly morning. In light air the fleet scattered all over the bay behind Angel Island. Boats that stayed east sailed into nothing. Boats that headed for Angel Island found little more until they hit The Current. Viking hit it first, just short of Angel Island, and quite honestly, never have I seen a boat sail sideways as rapidly as Viking. The current made apparent wind and Mike and crew developed an astounding lead heading for the weather mark before vanishing into the fleet. 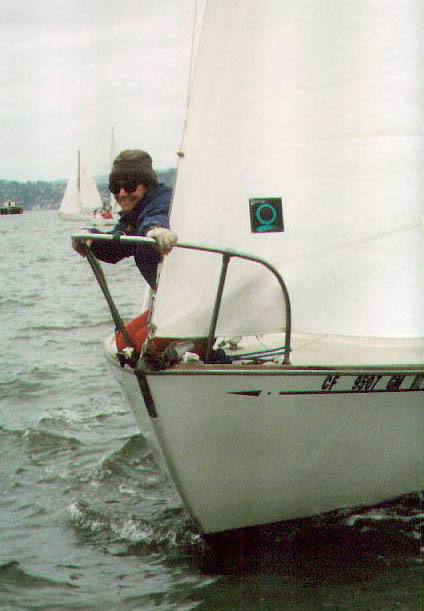 By various techniques we all got into the current which made wind as it swept us to the mark just off Treasure Island. "Hey! Now we're sailing. Where's the mark? There it is! Over by all those boats. Why are they all sitting there?" We found out as the world tried to round the mark turning into the current. One by one the Tritons rounded the bouy (Bolero, "boink", temporarily making it a bell-bouy... Ouch!!) Then the wind flat-out died. Don't ever remember the bay being so glassy. No way in this current. Anchors came out as the fleet drifted towards the Bay Bridge. The line on Dogstar's lunch hook wasn't long enough for the channel so in disgust we drifted/sailed for the City, looking for something better. For over an hour a windless fleet slatted and banged on the water between Treasure Island and the City. Somewhere in here Ebbtide broke its original equipment roller gooseneck. On Dogstar we stumbled into fitful winds and less current over by the City and managed to work past the waterfront, briefly becoming part of some sort of Grand Prix race drifting off Pier 39. Our frustration with the swirling winds was moderated somewhat by the fact that we were slowly moving ahead of the fleet. Then a light breeze; then we heeled; then roaring across the bay on glorious, sunny close reach. We finally rounded that mark by rounding both Alcatraz and Angel Island via Raccoon Straight. Coming out into the bay, turning left towards Richmond Bridge we wondered "Where are the other boats?" The wind moderated so, thinking we might be in the running for something, we decided to set the spinnaker. We got it up and, of course, the wind picked up. Being a bit new at the spinnaker stuff we'd never broached before. 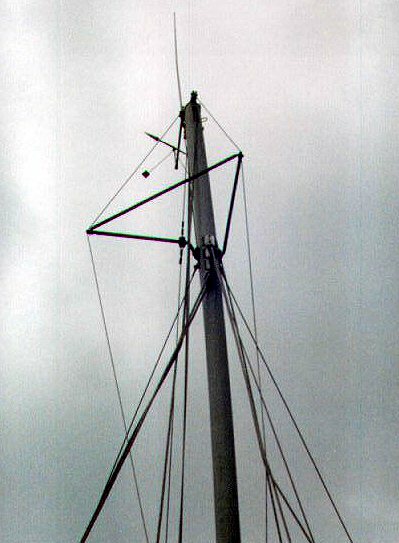 On the third or fourth broach our guy's turning block let go; the pole bent 90 degrees around the headstay; the spinnaker was flying to starboard 30 feet up, and by the time we got all that debris settled, we noticed bent/wrecked jumper struts and the mast's gentle but disquieting arc to starboard. Foolishly, we decided to retire. Motoring back we realized the true cost of this failure as we successively saw five Tritons cruising up the bay. We'd been about 20 minutes in first place; Oh No! Rounding the mark via Raccoon Straight would have been the fastest way to Vallejo. Driving up there for the party we found out the rest. 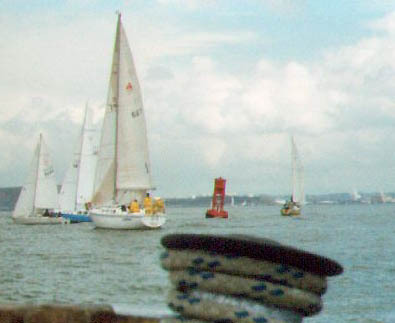 Several boats had given up off Treasure Island and fired up their engines. At Vallejo the fleet was welcomed by Richard and Harriett Golden and Karl and Laura Petersen. 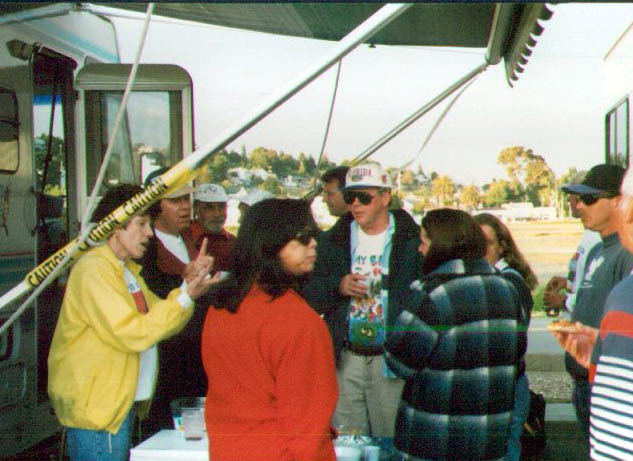 They'd parked their motor homes right by K-dock and had reserved several berths for the Tritons. Hey, Thanks! 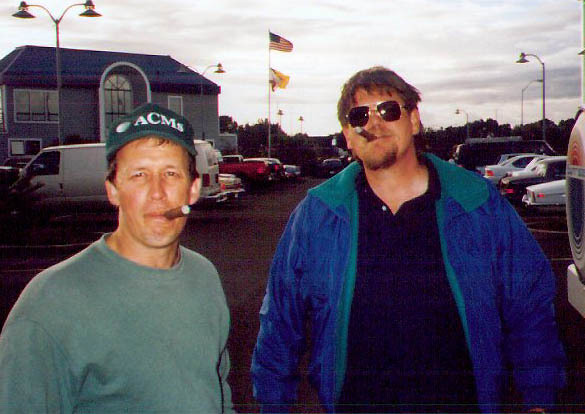 Nothing like a good Happy Hour (or in some cases, a good cigar) after a hard/wierd/costly day sailing! Sunday's race back, I'm told, was kinda different, too. According to Alan O'hara of Andiamo the race started in virtually no wind. 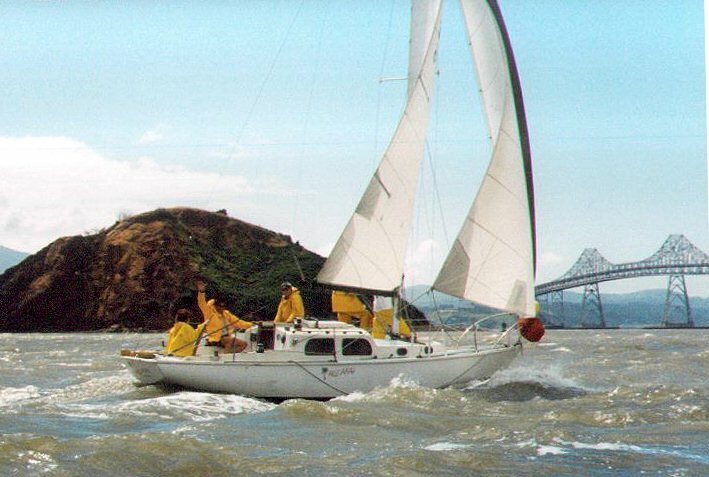 The fleet drifted down Mare Island Channel and then, out of the channel, actually set spinnakers to sail down to the main bay in virtually no wind. The current took over a large fraction of the fleet and pulled them south into the Pinole Channel at which point they DSQ'd. As I heard it, the trip back was no-wind; wind; grey; sunny; current; no wind; headwind. In the end, only Sleepyhead and Bolero finished with Bolero again taking first. Congrats to all those who participated and thanks to all those (except El Nino) who helped make this a memorable weekend!